Thank you for visiting the Business of Words webpage. 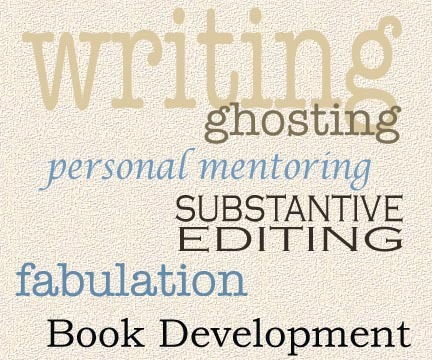 This is a comprehensive editing, writing and book development site. If you're finally ready to write that memoir or finish that novel, if you're a writer who aims to become an author, if you're engaged in the fearsome development of a thesis or dissertation, or if your business needs technical or promotional material, you've come to the right place. Well you should ask. There are a lot of fine editors and freelance writers offering their services on the internet. There are a lot of shabby operators and word mills too. How can you tell who's who? Speaking for myself, I'm first and foremost a person who likes working with writers. That makes me an editor. But I'm also a person who likes people with stories to tell, even if they're not writers. That makes me the writer and my clients the authors. And some years ago, when I saw how difficult it had become for authors to find a publisher without having to resort to self-publishing, I established Ocean Cooperative Publishing and later joined with others to set up the traditional small press, Encompass Editions. But whichever of these fits your needs, they're about people working together to see writing emerge from the creative process as something others want to read. So back to the burning question: who to choose? Just on the basis of common sense, be wary of anyone offering editing or writing services who is unwilling to provide you with some sort of free sample based on your project. Be wary of any service that requires you to pay a large retainer in advance for the privilege of having your project considered. Be wary of any service that requires you to submit your entire work, to be returned when it is completely finished. And for heaven's sake, if you're looking for an academic editor, make sure that the service you engage and the person working on your project is a native speaker of English and is based in an English-speaking country. There are innumerable exceptions on the Web. Please accept my invitation to pick up the phone right now and call me at 1-613-659-3666. I'll be delighted to speak with you, talk about the problem, offer any advice I can.